We've had many beautiful awesome ski days as a family. We've also had many disastrous days I wish I could take back and erase. Fortunately, the older my son gets, and the better he gets on cross country skis, the more good days we tend to have consistently. The three ski areas I'm featuring are our favourite places to go skiing as a family. They have it ALL and give you a good fighting shot at having a GOOD ski day with the kids. They are also all within an hour's drive of Calgary which is VERY important to us so that we can spend more time skiing and less time driving!! 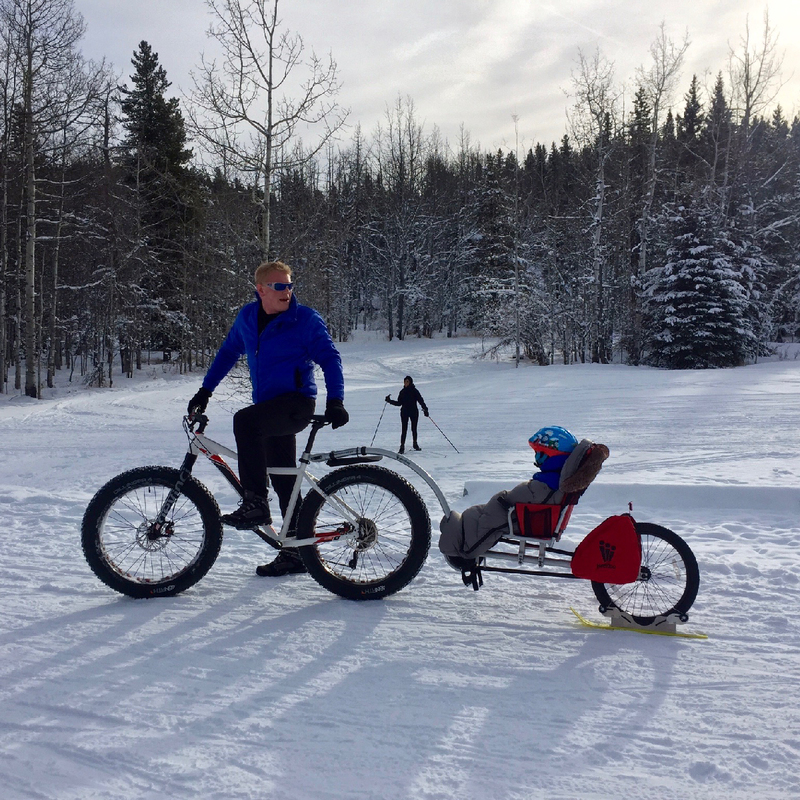 Referred to most often as just "West Bragg," The West Bragg Creek Provincial Recreation Area has a fabulous trail network for cross country skiing, snowshoeing, and fat biking. In the summer it is a mountain bike "mecca" and also popular with hikers. The trails are maintained and cared for by the Greater Bragg Creek Trails Association and all ski trails are groomed and track set by a dedicated group of volunteers. One. The New Trails Centre! There is a "Trails Centre" in the parking lot that serves as a warming hut of sorts. While it's not a log cabin or anything fancy, the trailer is well heated and cozy. We put on our ski boots in the trails centre so that our hands are warm when we start skiing. I also leave my son in the trailer (he's 8 years old) while I get the skis out of the car and get everything ready to go.This keeps him warm and he's always occupied reading the big map on the wall. Finally, the trailer is a great spot to have a pre-ski snack or to have lunch in after skiing so that again, you stay warm on cold days. Two. The Trail System. There's a great trail system with choices for all ski abilities. Many of the loops are blessedly short too so you can easily cut your losses if you're having a bad day. One of our favourite loops is to ski out on West Crystal Line until we get to the Moose Connector. We take that trail to the Mountain Road and then ski back down to the parking lot. The full loop is under 4 km and is great for novice skiers with a few hills to practice on. Another loop we've been working on is the Hostel Loop (much hillier) which is another short practice outing around 4 km in distance. Finally, my son loves the gradual descent down the East Crystal Line Trail (lots of double polling) so sometimes we climb up the big hill on East Sundog just to do the fun run down East Crystal Line. Again, this loop is under 4 km in distance. Three. Proximity to Calgary!! I can reach West Bragg Creek in 45 minutes from my house in West Calgary. This makes it easy for us to come out on a Friday afternoon if my son gets out of school early or for us to head out for a relaxed ski day if we don't want to wake up super early. Just note that the parking lot can become a zoo on weekends so you might have to arrive early if you want a spot to park. The trails never seem that busy though because skiers, snowshoers, and bikers tend to spread out on their own trails. Four. Skiing, Snowshoeing, and Biking - all in the same spot! There are dedicated ski trails, snowshoe trails, and fat bike trails here. The mountain road is the only "multi-use trail" where you can enjoy all three activities. In theory, this means you could bring both skis and snowshoes and do a little of both with a break at the trails centre in the middle. 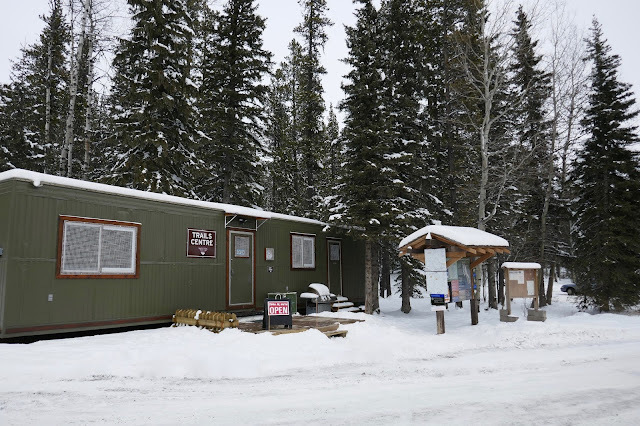 For information on trail conditions, to see maps for the trails, or to find out more about this area, please visit the West Bragg Creek Trails Association website. I also suggest making a donation at lease once per season if planning on skiing here. Your donation goes towards the purchase of new grooming equipment and helps with maintenance of the trails. 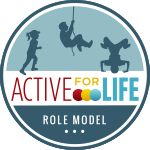 Without donations, we wouldn't be skiing, snowshoeing, or biking here. You can either donate on the website or you can leave some cash in the donation box at the trailhead. And want the inside scoop on trail grooming at least once a week? You can sign up for the GBCTA newsletter by going to their website and scrolling down to where it mentions the newsletter and donations, both in the right hand side bar of the site. One. The Day Lodge Building. I'm a huge believer in starting out warm. I like to put my ski boots on inside a warm building, I like to add final layers inside, and I like to give my son a pre-trip snack before we head out. I pack everything into a duffel bag and haul it all into the Nordic Centre main building. We stash the duffel bag and our winter boots under a table or in a corner somewhere and then head out to ski. Usually my husband is with us and so he can take the skis out to the front of the building while I'm hauling everything else inside. Even on my own though, I manage to get the skis and everything else to the lodge in one trip from the parking lot. When you're finished skiing you'll enjoy the day lodge for a post-trip snack and a cup of coffee from the cafe. It's also a great place to hang out with younger kids while one parent might want to go for a longer ski with older kids. Two. The New Meadow Warming Hut. The meadow hut is absolutely gorgeous and it's the perfect spot to ski to with young kids for lunch. At a distance of roughly 5 km round trip, most families should be able to ski as far as the hut before having to turn around. The promise of reaching the nice warm hut is a great incentive to keep kids skiing and it's accessible via a very easy green trail that has few hills. Skiing Banff Trail to the hut and back is a great trip for novice skiers and families. For full information on skiing here, visit the Canmore Nordic Centre's website which has a trail map along with details on day passes and hours. While there is no warming hut or trail centre here, I can overlook that for what IS here: The Delta Kananaskis Lodge with its gorgeous fireside room, cafe, and skating rink. There's also a sledding hill and if you stay overnight, a beautiful outdoor hot tub. Really, there's nothing not to like about these ski in/out accommodations. Regardless if you stay overnight or not, you can still warm up after skiing inside the lodge, grab a coffee, and unwind after with a short walk around the property, a stop at the playground, or some skating on the pond. One. The Delta Kananaskis Lodge. As just mentioned, we go inside the lodge after skiing anywhere in the Kananaskis area. We buy a coffee and some fresh baked goods from the cafe, and then we sit down beside the fireplace in the giant fireside room. 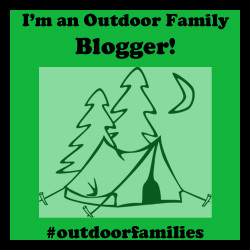 Kids can run around (within reason) and warm up, I can upload a photo or two to my FB or Instagram account, and we can just relax for a bit before the drive home. Two. The Wide Assortment of Activities on Site. Face it, you won't know what kind of ski day you're going to have with kids until you start out. Fortunately, the Terrace and Terrace Link Trails form a short 4 km loop and then you can call it quits for one of the other activities at the Village. Bring the skates, a sled, your winter boots for a short walk, or even the snowshoes and you'll have plenty to do here for a whole weekend. Good thing there's a hotel on site! Four. Variety of Trails. Families can ski the Terrace Loop from the Village in a short 4 km return trip. Start from Ribbon Creek below and you can ski to Troll Falls and back in as few as 3 km return. Other options are plentiful though and we like doing the Terrace Trail from the Village to Kovach and Aspen. Then we descend back down to the village on a very fun downhill section of Kovach. We've tried this trail in both directions and we definitely prefer doing it counter clockwise so that we get to go DOWN the Kovach Trail hills at the end. Going up was not much fun last time. This full loop is roughly 6 km and is made up of beginner and intermediate trails. Five. Rentals on Site. You can rent everything from cross country skis to ski pulks, skates, sleds, and snowshoes, and fat bikes at Kananaskis Outfitters. They also offer great tours. For more information on skiing, open this PDF document on the Ribbon Creek and Kananaskis Ski Trails. For more on staying overnight here, visit the Delta Kananaskis Lodge website. To read more about Kananaskis Village in Winter, read this story I wrote: Ten Reasons to Spend Time at Kananaskis Village this Winter. 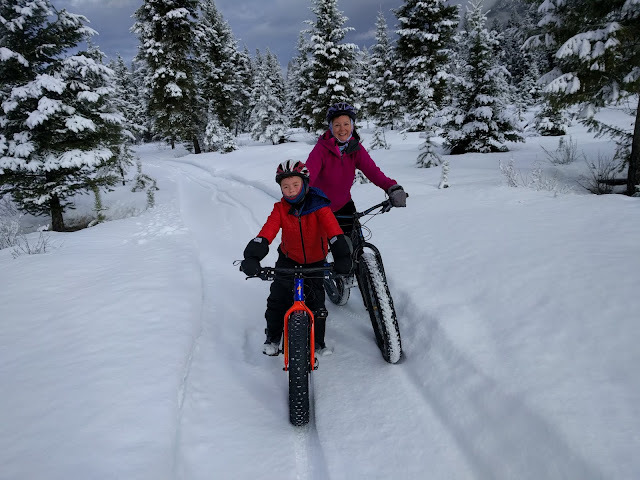 To read about staying at the HI Kananaskis Hostel, read this story I wrote: Affordable Family Ski Vacations in the Canadian Rockies. And you can visit the HI Kananaskis Hostel website directly too. There are a LOT of amazing places to ski that have not been mentioned in this story but I really tried to limit it to destinations that are reached in roughly an hour of driving from Calgary (or less.) Any longer than that and I start looking into lodging so we can make a weekend of the trip. Below are three awesome destinations if you want to plan a ski weekend and want to find some sweet ski in/out accommodations for cross country skiing. We recently stayed at the Lake Louise Alpine Centre and you can read about our adventures here: Family Guide to the Lake Louise Ski Resort. Rest assured, the story does talk about cross country skiing and gives you all the info you'll need if you want to stay at the Alpine Centre. The Centre is a hostel but has plenty of family rooms and private dorms. It also has a large kitchen so you can cook your own meals. Nipika Mountain Resort is located on the border of Kootenay National Park and is a true gem of a place for cross country skiers. Stay in a cozy cabin (or rent the Rocky Mountain House which sleeps 12 people) and enjoy ski in/out lodging on an amazing trail network of flawlessly groomed trails. And there are roughly 100 km of trails here so while you could visit for a day, you really want to spend a weekend. Also on site is a skating rink, sledding hill, snowshoe trails, and fat bike trails. Rentals and guided tours can be arranged, and I know for fact that there are two kids' fat bikes for rent (a 20" bike and a 24" bike) because I was there the day they were purchased and added to the rental fleet. To read more about Nipika Mountain Resort, read my story: Everything for a Family to Love at Nipika Mountain Resort. And check out my newest story on Fat biking at Nipika Mountain Resort. You can also read The Ultimate Girls' Ski Getaway at Nipika Mountain Resort. 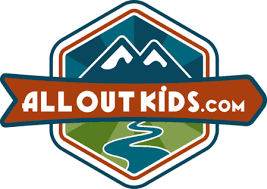 And to plan out a summer biking trip, read Kids On Wheels - Nipika Mountain Resort. From Lake Louise, head over into Yoho National Park and spend a weekend at Emerald Lake Lodge. Enjoy ski in/out lodging on beautiful Emerald Lake, decadent dining, and a cozy lodge with fireside lounge you can play games in over a hot chocolate after skiing. We recently stayed here for a weekend and enjoyed cross country skiing and snowshoeing around the lake, relaxing in the outdoor hot tub, hiking up to see frozen waterfalls, and exploring a natural bridge. You can also visit Emerald Lake for a day trip but it's a long drive from Calgary so you'll appreciate an overnight stay with kids more. Plus, if you stay overnight, it's easier to base your ski adventures from a cozy base camp. You can take turns skiing with the kids or heading out for a short solo ski as an adult. Finish your day at the hot tub and alternate between short ski outings or hikes around the property. 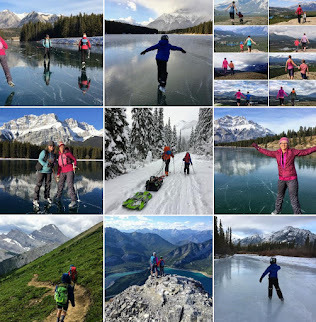 To read about our adventures, read Family Weekend at Emerald Lake, Yoho National Park. See you on the trails and let me know if I missed your favourite place to ski.